The International Potato Center (CIP) together with the Food and Agriculture Organisation in Mozambique hosted a delegation of Heads of Cooperation (HoC) of the European Union interested to learn about aspects and approaches to promoting nutrition-sensitive agriculture. 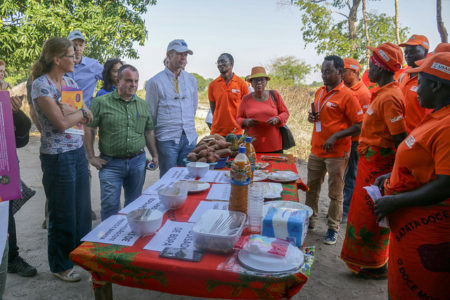 CIP showcased nutrition activities under the Viable Sweetpotato Technologies for Africa (VISTA) project on 30th of October in Alto Molocue, Zambezia province. Dr. Maria Andrade, CIP Mozambique Country Manager welcomed the delegation and provided a summary of CIP work in the country funded by UKAID, USAID, Irish Aid among others. She explained that the VISTA project employed a three-pronged integrated approach: agriculture-nutrition-marketing to sustainably improve the food security, nutrition and income of smallholder families. 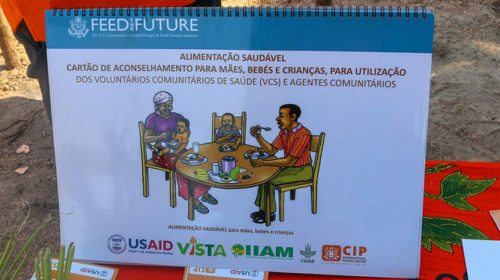 Focussing on nutrition, Dr. Andrade highlighted CIP’s approach to combating malnutrition especially Vitamin A deficiency under VISTA funded by USAID. 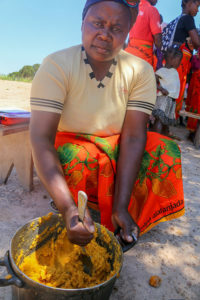 This is being achieved through training health workers on nutrition education and counselling; development and promotion of recipes and guidelines for household level OFSP utilisation as a healthy food for all – with specific focus on children under five; broad education campaigns on nutrient rich foods. Community health workers (CHW) and promoters demonstrated use of counselling cards to disseminate information on balanced diets and incorporation of orange-fleshed sweetpotato (OFSP) into local foods. Such messages are reinforced through folk songs and short dramas performed by local women and the health workers. The CHWs also showcased how they conducted home visits for women who were unable to join group sessions. Community members working closely with CHWs and promoters prepared OFSP based foods integrating the root into locally available meals. The group learnt about such through cooking demonstration community sessions aimed at improving family nutrition. Special focus is directed at meals for children under five as well as expectant and lactating mothers. The visit to showcase CIP nutrition activities was organized by DFID Mozambique who hosted the HoC from 28 October to 1 November 2018 in Nampula and Northern Zambezia provinces. 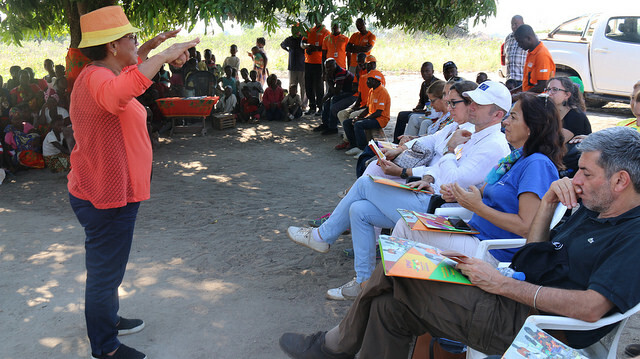 The delegation also visited other programs funded by the EU in the two provinces with a key aim of gaining stronger awareness and understanding of impact of malnutrition on Mozambique’s economy and welfare; structure of nutrition multi-sectorial response in Mozambique – policy, financing and delivery system; and challenges on nutrition programming.